This recipe was a happy accident. It came out of me just playing around at mealtime, trying to serve the kids veggies in a way other than roasted, steamed or cut up raw with a dip. 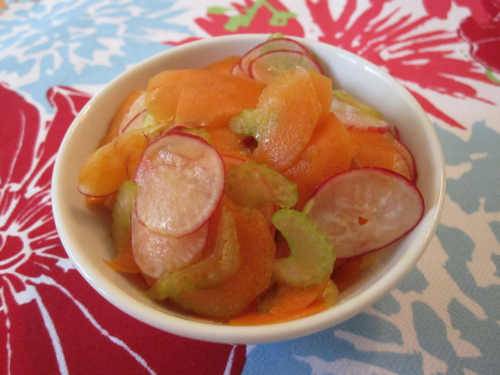 I love using my Mandoline Slicer because it makes cutting up foods like vegetables a breeze. You can set it to slice veggies from thick to paper-thin. And even though my kids love watching me use it in the kitchen, I wasn't expecting them to take to my little food experiment. After all, to them, salad is still salad. But Kenya loves pickles and other tart foods, so I was hoping that a splash of vinegar would steer him in the direction of loving this dish -- and it did. I was really shocked, though, when Chloe (our 17 month old), gobbled up three portions in one sitting! Sometimes just using a cool kitchen tool and adding the right seasoning will transform something your kids normally wouldn't bat an eye at into something fun and delicious. 1. Using a hand mandoline, shave the vegetables into thin coins. 2. Place all the ingredients in a bowl and stir to combine. 13 Recipes for the Best Backyard BBQ! My mother makes something like this but we let it marinate overnight or a couple of days...we use mainly carrots and daikons. Radishes are great too. We normally eat these with lemongrass chicken kabobs.